Happy New Year everyone! It's been madness here in terms of stay-making. 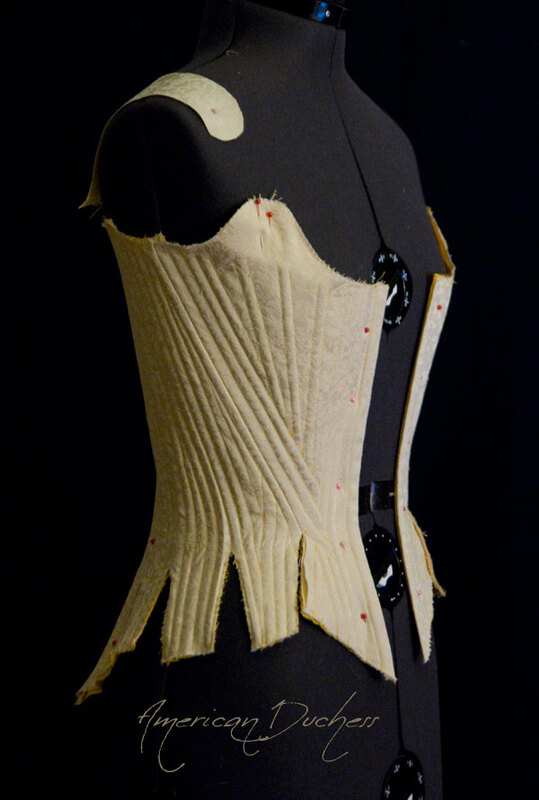 I've got Olympe's final pair in-progress, all the boning channels stitched, with one side boned. Here's how Olympe's stays are coming along. We made changes to the pattern based on the pink prototype. I've put the pink prototype stays up in the Etsy shop, for anyone looking for a pair to buy *right now* with no waiting. 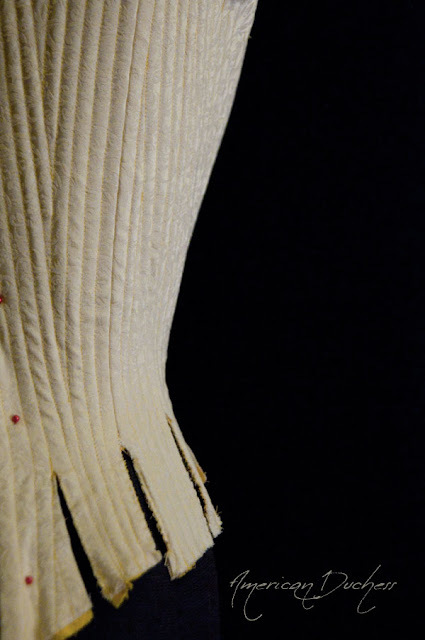 I'm also determined to try out some new methods and patterning on a pair for myself, to explore the silhouette of the 1780s, and to finally have a proper pair for my own body. The pink proto-stays are for sale in the Boutique. They don't fit my dress form, but *will* fit a lady of proper measurements! A detail shot showing the boning channels. I used metal eyelets on these, to save time, but I know these are not historically accurate. If you are interested in these stays, you can buy them as-is, or for a little extra money I can cover the eyelets for you. In other news, the down payment for the 18th century shoe prototype has been sent and I am expecting the prototype to arrive in about 2 or 3 weeks! Thanks guys! Anna - when I draft the patterns for stays I usually do four pieces (per side), and they are kindof an aggregate of various extant stays patterns. I will change the front piece shape depending on what decade they stays are to represent - for instance, the bow-shape for the 1780s, or the more flat-fronted for earlier decades. A lot of times I will look at museum examples to get an idea of what I want, then try to go in that direction. For the boning channels - if they are fully boned, I find it MUCH easier and more "organic" to sew. I use 1/4" channels, and start with channels on either side of all the seams, after which I sortof "fill in the gaps" trying to go mostly vertically. The front piece usually has some sort of small fan pattern, or a "braided" pattern of stays. No pair of stays ever comes out exactly the same. For the spacing - my the presser foot edge run right along the previous stitching line will give me a 1/4" channel, otherwise it would be a nightmare! I usually only mark the major channels, like the fan on the front, with a pencil. 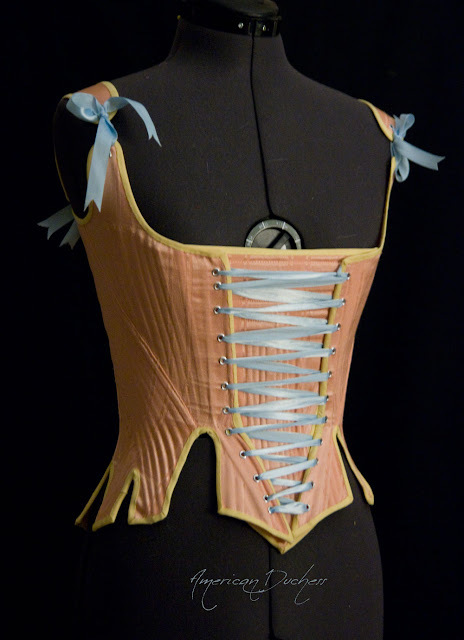 Hello, My other half and I are re-enactors, of different periods, He does 18th Century and has invited me along to one of his events, I was just wondering how much you would charge for the pink stays - the ones you put in the shop would have fitted me perfectly! Unfortuantly I am too late! - I've got to make a whole 1780's riding habit! and the stays I find most difficult! Georgina - What is your e-mail, so I can contact you off-blog? 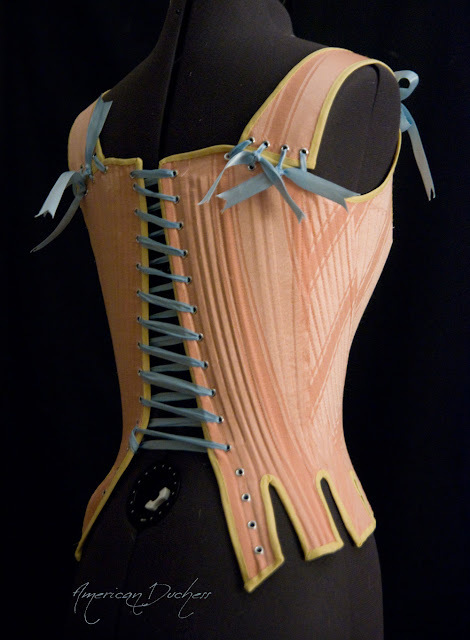 Or you can drop me an e-mail at renreeser@gmail.com , and I will send you my corset price guide. Lovely! 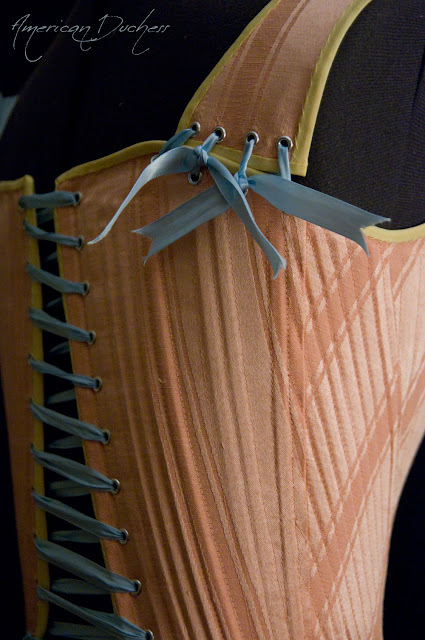 I adore the fabric of Olympe's stays. Lovely work on the stays, they remind me of the Manchester Stays (1640-1660) in the Manchester City Galleries. Of course a different century but for some reason they are evocative of that set to me. If you don't know what I am talking about let me know and I will send a picture or link. The cream colored stays look very good now. I can't wait to see them finished. That is lovely fabric! Agnes - I haven't seen the Manchester stays, although I have a slight obsession with mid-17th c. items :-). Could you send me a link? Jo, I agree, it's beautiful fabric with a very subtle florally swirly thing going on. Delicious!